Chronological (best) ordering of posts. All reports indicate that the global downturn is escalating incidences of anxiety and depression in people – not just for those who find themselves unemployed, but also those who remain in an unstable workforce – unsure of what is going to come next… trying to cope with the change the situation has wrought, and juggling with new financial constraints and a fear of the future. What’s happening? When we perceive situations as scary and a danger, our bodies turn on our fight or flight systems and we often feel an inability to cope. If this continues over a period of time the fears can grow and become unmanageable, and we may develop unhealthy negative automatic thinking distortions, and our coping skills may break down. Thus our physical and psychological health suffers, and we experience emotional disturbances (or to put it simply, we feel awful! ), and we behave in ways that are unproductive. That’s Cognitive Behavioural Therapy (CBT) 101! So… given these facts – shouldn’t we acknowledge that this recession may very well bring depression and anxiety to large numbers of people? Now that our emotional resilience is being tested in unprecedented ways, is it time to normalise psychotherapy, and make it ‘no big deal’? To destigmatise it and bring it’s teachings proactively to people in a ‘non therapy’ educational way? Is psychotherapy just for people who have obvious mental health issues? No – smart modern psychotherapy tools are, or should be, for everybody! Besides, often people who are suffering don’t label themselves as ‘ill’ – and/or they feel they should be able to handle it themselves – or feel it’s ‘just the way things are’ – or don’t have the time or money or inclination for months of weekly traditional therapy. And of course there are many people that can be prevented from a future emotional illness if there is early intervention and they are given the knowledge and tools now to stay off that road, (the World Health Organisation says that one in four of us will suffer with a mental illness at some stage in our lives, but nearly two-thirds will never seek help.). Prevention is better than cure. We know that personal development is a good thing. We know that education and learning is a good thing. Hey, it’s not so long ago we learned we needed to exercise regularly and eat sensibly for our physical health – so why shouldn’t our schools and governments and doctors and bosses now automatically offer us modern (and proven) psychotherapy methods and techniques that help us to take care of our emotional health? Such learning might save us from years of an emotional rollercoaster that disables us from living life to the full. Apart from the obvious benefits on personal lives and the workplace and society, it would also enable savings on the enormous monetary costs of anxiety and depression (a recent report showed that mental illness cost Ireland €3 billion in a given year, and that two thirds of that is ‘economic output’). Are we talking about actual Group Therapy? No. That wouldn’t be a good idea for the workplace – there’s sharing and there’s sharing! No – an effective and inexpensive start to the introduction of psychotherapy to employees might be in the form of a ‘learning by discovery’ workshop – which is fun and interesting and educational – that promotes positive mental health, and uses general hypothetical situations to encourage discussion while learning the basic principles and theory and practices of the worlds leading psychotherapy ‘CBT’ – which is a psycho-educational model and has proven to lend itself well to ‘self-help’, effectively teaching participants to become their own therapists, and to develop new skills in self-management. (The NHS in the UK have a much more significant spend on research and treatment of mental health than Ireland – and their commissioned studies have determined CBT to be the preferred/first choice of treatment for all mental illness related issues – they are even setting up CBT in their jobcentres to proactively help the unemployed!). 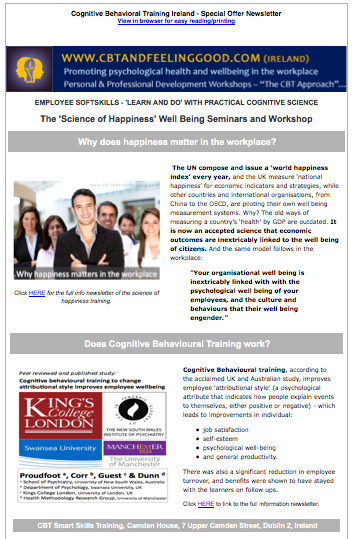 Click to go to the post about cognitive behavioural training for employee well being…. So this is just dipping in – what should people do if they want ‘more’? Some employees might use this learning as a stepping stone to one to one ‘deeper’ CBT counselling if they think it necessary – either through an employee assistance program, or privately by their own means. Alternatively, they may decide to continue the learning and development as ‘self-help’ – using the workshop handouts and exercise worksheets and journal tips, and accessing the recommended reading list for further development. There are also various ‘computerised cognitive behavioural therapy’ options available for further study. I provide employee Cognitive Behavioural Training workshops – promoting psychological health and wellbeing through education. 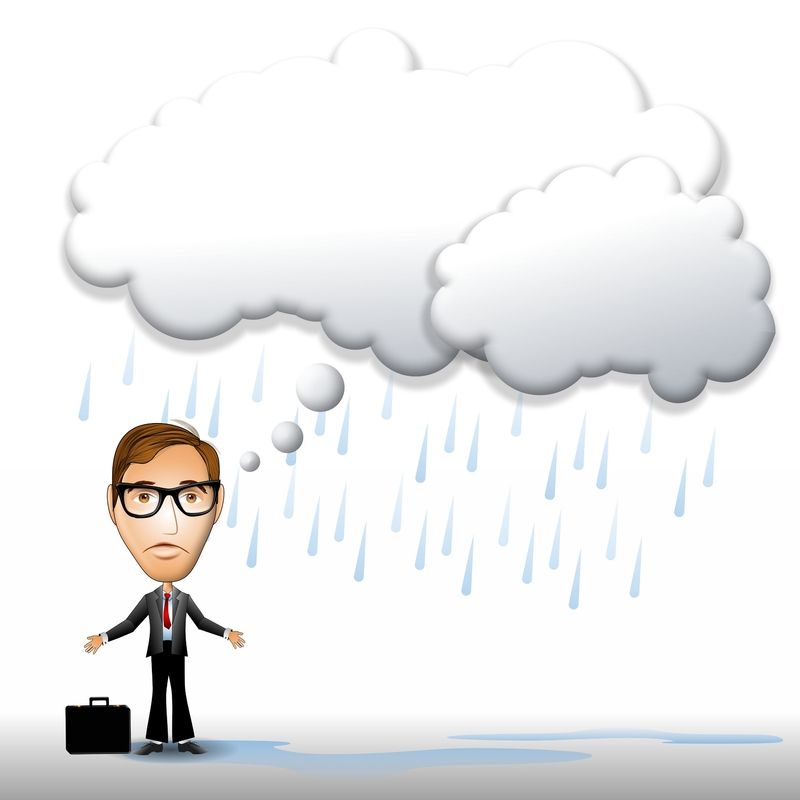 CBT teaches you to ‘think about thinking’, and gives you practical methods and techniques to recognise and examine and change ‘unhealthy thinking’ around stress triggers – and to understand and manage emotional and physical responses to stressors – and to recognise and change self sabotaging behaviours… it will give new skills in self management. This is personal development training, NOT group therapy. NOTE: CBT & Feeling Good approved Training Programs and Trainers were accredited and approved for placement on the FAS and Enterprise Ireland National Register of Trainers. (Registration # 903680.) In full compliance with the Qualifications (Education and Training) Act 1999. Fully accredited and insured. NOTE – We do not recommend our workshops as a replacement for professional mental health treatment by your GP or another recommended expert if you have serious emotional difficulties. 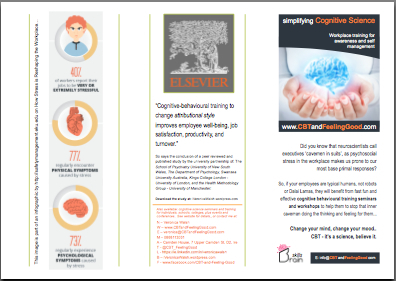 We report, for the first time in the literature, a cognitive-behavioural training waiting-list controlled study that changed employees’ attributional style, reduced turnover, increased productivity, and improved a number of individual differences measures of well-being. One hundred and sixty-six financial services sales agents (98% male, mean age 36.2 +/- 9 years) were randomly assigned to either (a) a seven-week cognitive-behavioural training program or (b) a waiting-list. Significant improvements resulted in employees’ attributional style, job satisfaction, self-esteem, psychological well-being and general productivity. A significant reduction in employee turnover over a 4.5 month period was observed. The waiting-list Control group replicated these results When they subsequently went through the same program. These findings demonstrate that work-related attitudes and behaviours, especially in motivationally challenging Occupations, can be changed with cognitive-behavioural training to improve attributional style. The Study is also valuable for personality and Individual differences research because it shows how psychological variables can be changed by effective intervention in applied settings. (C) 2008 Elsevier Ltd. All rights reserved. To set the scale in perspective – the World Health Organisation’s evidence based scale says that mental illness is the largest single illness of people of working age, and as big as all other illnesses put together… as big as back pain, cancer, diabetes, everything, all physical conditions put together…. Extraordinary. Half of all days off sick are due to mental illness. Richard Layard of the London School of Economics tells us that he attended the DAVOS Workplace and Wellbeing Alliance meeting this January, which was a 90 minute seminar by and for sixty of the worlds largest and most enlightened companies – yet it was only in the 85th minute that mental health was mentioned.. all of the time had gone to discussing cancer and aging and diabetes and lung conditions and so on. Nobody wanted to discuss mental health, but the cost is huge. On all levels. Another issue currently being measured in group studies is ‘presenteeism’ – which is when the employee is in work, not absent, but is underperforming (and/or negatively performing and affecting others) as their mind is elsewhere with mental health issues. This is thought to be a large number and climbing. Another issue for organisations to consider is that half of all disability benefits are due to mental illness. It’s time to act. We now have proactive preventative and curative solutions using modern psychotherapy – Richard Layard / The London School of Economics and NICE (UK) recommend Cognitive Behavioural Therapy as a first choice solution – including ‘low intensity CBT’ – which is what I do. Call for information! Keep on writing informative and accurate blogs! This blog takes PRACTICAL evidence based therapy out of the counseling rooms – turning it into fascinating ‘learning by discovery’ training that you can do yourself. Image Magazine article on worry & stress…. 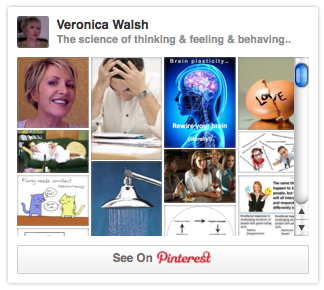 Link to my Pinterest page for easy navigation by image.. 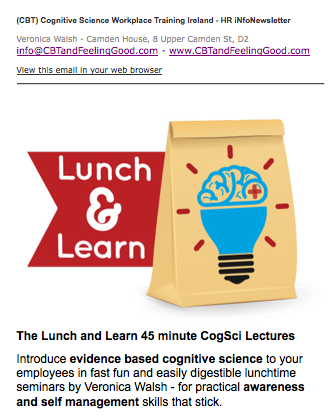 The mind is the brain which is attached to the nervous system: a CBT tour…. Newstalk radio audio about meetup.com and making new friends.. (managing loneliness). A CBT look at crooked thinking and being the cause of our own upsettness. The stress disorder and self sabotaging behaviour checklist table…. Click to see special offer for one to one private sessions – (only €35 for an intro hour, including exercise handouts) Click for CBT and Feeling Good newsletter with special offers…. Link to Irish Times article about the 'Coping Skills for the Unemployed' workshop (original is archive paywalled) Click for a feature article in the Times about the CBTandFeelingGood Coping Skill sworkshop …. Link to my published artcle for the Dublin City Enterprise Board online news 'CBT in the Workplace' ‘Companies on the couch’ – should cognitive behavioural therapy be applied in the workplace? Book a CBT session, in Dublin’s Camden Street, or online….